Anarchism is founded on the respect for the individual. Anarchism nurtures the individual’s development whether it be physically, politically, spiritually, mentally, creatively…etc. The true anarchist goes through life developing his/her idea of himself/herself and this search for identity manifests itself in many different forms. The only way for the anarchist to discover his/her identity is to experience and distinguish his/her own individuality within the rest of society. The quest for ultimate liberation and knowledge of self is what makes anarchy appealing. The process by which the individual attains that liberation distinguishes the individual’s journey for liberation. Many anarchists, therefore, mark their own journey by the artwork that reflects their own struggle for self which is why anarchy and art are undeniably intertwined. The quintessential person who first identified this expression allowed by anarchy through art was Herbert Reed, a very important English art critic of the late 20th century. Herbert Reed discovered the application of aesthetics used by anarchists with politics. He was an anarchist himself and the premier art critic of ceramic arts. He acknowledged the parallelism between arts and politics as social and artistic processes as they both claim their foundation in the innate nature of creative processes. He believed that truly good art and good politics (anarchy in his opinion) come from the same creative and mental place. He believed that art is the only true revolution and that the process of artistic expression was compatible with anarchist expression as they both are a form of the individual. He thought the artist allowed everyone to discover laws of nature and since anarchists are against unnatural organization, the artist and anarchist are very similar. Francisco de Goya. 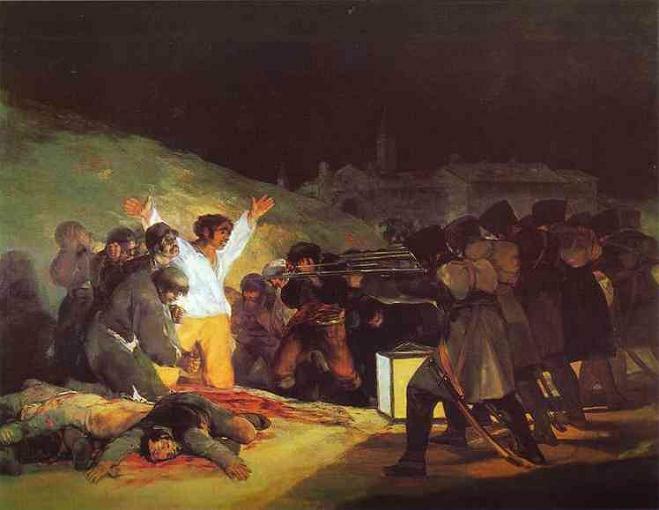 The Third of May, 1808: The Execution of the Defenders of Madrid. 1814. Oil on canvas, 266 x 345 cm. Museo del Prado, Madrid, Spain.